Customers are always saying "this is the best coffee we've ever had"! They love all the different flavors we are able to offer, and we're the only coffee shop to offer unique flavors in decafs as well. As a proud café owner that serves KMO coffee exclusively, I was reviewing your website and I came across the KMO Creed which in part states, "We have the best service in the business." The purpose of my email is to write to you regarding our KMO representative, Meghan. Based on our four months with KMO, Meghan has upheld your creed impeccably. Whether it be a last moment order or a simple call to check on our success, we are pleased to work with such a wonderful, caring person that has made starting and maintaining our café both successful and enjoyable. I ask that you please recognize Meghan for her success. In locating a roaster, we were certainly concerned with quality and taste as are most cafés, however, it was our original contact with Meghan who effectively explained KMO's mission, benefits, and guarantee that helped to cement our choice to use KMO. In closing, I wish to thank you for your vision and commitment to quality and customer service, two things that are greatly lacking in today's society. Should you continue to seek individuals that uphold your Creed such as Meghan, I can view nothing but success for your company. Your customer service has been awesome. And we have really picked up with our business and our sales because we have been able to offer such a wide variety, with Kaffe Magnum Opus, to our customers. We really appreciate all you do. I like that folks at KMO read customer comments and respond quickly. I also like the fact that every time I call, I get a friendly helpful response... I like the fact that you're thinking about customers, our concerns and happiness. Thanks to all of you for delivering my coffee over the holidays in record time. I always come in close to or beyond the cutoff time for same day delivery and you guys always pull me through! We really appreciate it. A note from the CEO & Founder, Bob Johnson: The following is a response from a consumer who initially wrote to us to express her dissatisfaction with a flavored coffee purchase. We are happy to say that we now have a satisfied customer and continue to stand by our “100% Satisfaction Guarantee” policy at Kaffe Magnum Opus. 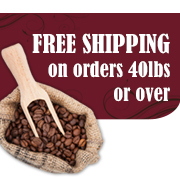 “Your sales staff contacted me to choose (replacement) flavors of coffee. I had no idea your company had so many flavors. She sent them to me very quickly. That in itself is exceptional customer service. Not only was the coffee sent, but also a (reimbursement) check and a delightful surprise package of M&Ms. Imagine that! How wonderful to know that there still exists a business who can truly tout phenomenal service. So here goes my and my husband's opinion on the coffee we received and tried so far. Blackberry Merlot - Wonderful, love it! We could smell the blackberry as soon as the bag was opened. The basic coffee aroma was good and fresh. Once brewed and the moment we tasted it, we knew it was a keeper. The taste was smooth, left just the right amount of lingering taste, and we could detect the blackberry flavor with each sip. White Choc Wrascally Rabbit - Wonderful, love it! Just as with the Blackberry, this coffee was great from the moment the bag was opened. It, too, was smooth, left just the right amount of lingering taste and we could detect the white chocolate flavor with each sip. We love KMO!!!! There aren't many suppliers out there that have a win/win relationship with their customers anymore. I've been in retail my whole life and we strive to be very attentive to our customers needs as well. You do a good job of that and we appreciate it. I sometimes can't get suppliers to return my phone calls let alone analyze my spending habits!!!! Thanks for always giving me Great Service! I am just an individual, who used to buy coffee in the can. I use to buy [another brand] Dark Blends, already ground. A friend of mine, turned me on to you guys a few years ago, after he gave me a sample of your beans. So I bought a grinder, and tried his sample. I didn't know why I was drinking that other crap before. I've tried other beans from other companies, but only if I run low, and don't get my order in to you in time. I try not to let that happen; my customers notice and so do I. You guys give me great service and have great products! Thank You for the years of service, and giving your customers value and taste all in one. It's always Fresh and On-Time. I woke up this morning to that heavenly smell thanks to Kaffe Magnum Opus. I'm a big coffee drinker - I love my coffee. Yes, I have K-cups for emergencies, but nothing beats a pot of fresh brewed coffee. I thought I had tried them all until a friend delivered a pound of Kaffe Magnum Opus fresh roasted Costa Rican Tarrazu - the entire kitchen has that warm, enticing smell just welcoming morning - you know it's going to be a great day!